Fun and Functional, it's the gift that keeps on ticking. Offered in a rainbow of colors! 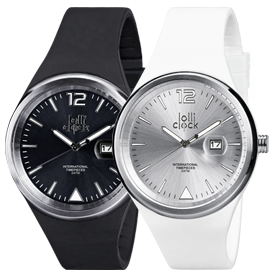 46mm full stainless steel case over-molded silicone strap, sunray dial, water resist to 165', 3 hands movement with date. Up to 3 Pad printed colors. See set up charges listed below. 2 year warranty, manual, full color standard gift box. STOCK COLORS, LGN Light Green, OE Orange, RD Red, MG Magenta, LBE Light Blue, BE Blue, BK Black, WE White. 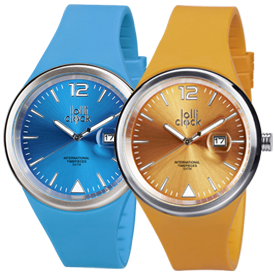 For pad printed dial add $40.00 (g) per color, up to 3 colors. For over 3 colors add 0.30 (c) per color run charge plus additional $40.00 (g) set up per color. 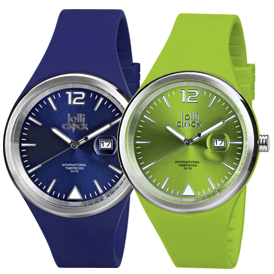 For full color offset printed dial, $80.00 (g) with no run charge, minimums apply. Custom packaging with your full color artwork available for orders 250 and up. Click here to view pricing. Custom strap with PMS matching available for order 500 and up. 4 weeks after artwork approval. Shipping weight is approximately 7lb per 25 pieces.